This December I plan on reviewing several different versions of E. T. A. Hoffman's The Nutcracker. Before I start with the book reviews, I've decided to highlight something a little different, an awesome Nutcracker storybook app that happens to be available for free today on Apple itunes! If you're a fan of the Nutcracker ballet and enjoy the music and the story, this is an app you must absolutely download! 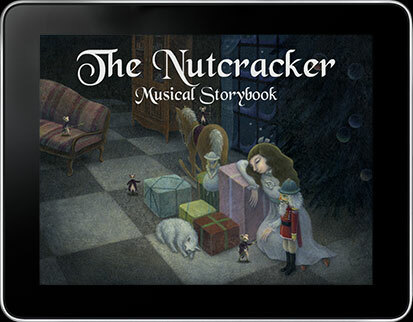 The Nutcracker Musical Storybook is an animated, interactive app based on the ballet version of the Nutcracker. This app by Mouse King Media combines excerpts of Tchaikovsky's music with a short, picture book format story featuring artwork by Yoko Tanaka. The app can be played as either a storybook or movie version. Illustrator Tanka channels some of the Sugar Plum fairy's magic and beautifully captures the fantasy elements of the Nutcracker in her lovely, enchanting illustrations. It's a splendid treat to interact with this app -- Clara, the Nutcracker, the seven-headed Mouse King and all the dancers magically to spring to life right on the screen. The scenes in The Land of Sweets are incredible, particularly the Russian Dancers scene. The story is not narrated, like other storybook apps, so children will need to read the words themselves or have an adult read aloud the story. I purchased The Nutcracker Musical Storybook for our Kindle Fire last month. Since both my kids are performing in the Nutcracker this holiday season, I thought they might enjoy an interactive version. I highly recommend this app. Even if you can't get it free, it's still a bargain at $2.99. The app provides a nice introduction to both the music of the Nutcracker and also the basic storyline.